I guess like most people who work a lot with computers, I have a large number of computers in a “server room” (my loft). I’m too cheap to buy actual servers though, so most of these computers lack any sort of remote management / IPMI / BMC etc. I also just bought 6 Intel NUCs and these are also ideal as development servers, but unless you buy very specific (and unobtainium) versions they don’t come with remote management either. Could we design a small USB device which would turn an ordinary PC into a remotely managed server? What would we want it to do? Reboot remotely (like hitting the power switch, but remote). Unattended operating system install and reinstall. At first the answer is obviously no since you cannot capture the display output from this device, but let’s ignore the display for a moment. My initial idea was that you could simply have a USB flash drive which would have some kind of minimal remote operating environment. You would have to reconfigure the server BIOS so it always boots off the USB drive, and the USB drive then either chain boots to the operating system or can interrupt the boot process to download a new image. This lets you reinstall an OS, but not much else. However USB can do a whole lot more, including acting as a keyboard, and it’s possible for a single USB port to provide multiple functions like drive + keyboard. Could we design a USB peripheral which would inject keys (like Ctrl+Alt+Del to soft reboot)? It could also blindly control the BIOS by injecting keys. Designing a USB peripheral is a bunch of work, but the hardware to do it already exists. The Raspberry Pi Zero can act as a USB device (known as a Linux USB gadget). So the idea is you’d connect the RPi Zero to the server using a USB OTG cable. It would appear as a keyboard and mass storage device (but unlike above you would not change the server to boot off USB, it boots normally). The RPi Zero could be remotely accessed over wifi and using that you could inject keypresses (like Ctrl+Alt+Del), and present a boot disk to the server, and using blind keypresses negotiate the BIOS menus to select an alternate boot disk when you want to reinstall. You can also act as a virtual serial console gadget allowing simpler interactive use for some operating systems. One problem here is the RPi is powered from the server, so when it reboots it’s possible it will shutdown (but perhaps not if plugged into the yellow USB ports since I guess those should have constant power). Another problem is you can’t see the display, so you’re driving the BIOS and other menus blind. But it’ll probably work in most automated cases. USB has a video class but I’m not clear if it would help here (it also wouldn’t be any good unless the server BIOS could use it). A third problem is you cannot hard reboot the server in case it hangs. My virtualization cluster is also coming up to 4 years old, and while it works fine it turns out that running servers without cases isn’t such a good idea because they generate large amounts of RF interference. The total cost (including tax and delivery) was £583.96 from scan.co.uk. I also specced up a similar system with an M.2 SSD which would have been about £670. (An ideal system would have both M.2 SSD and a hard disk but that gets even more expensive.) The NUC model is NUC7i5BNH and the Wikipedia page is absolutely essential for understanding the different models. It has two real cores with hyperthreading. The cores are Kaby-Lake Intel(R) Core(TM) i5-7260U CPU @ 2.20GHz. The compile performance is reasonable, not great, as you’d expect from an Intel i5 processor. It also has the Aspeed AST2400 BMC so it’s possible to manage it remotely using freeipmi and (for the video console) Java. * Insane literally — This machine has the same amount of L3 cache (40 MB) as was the size of my first hard disk. 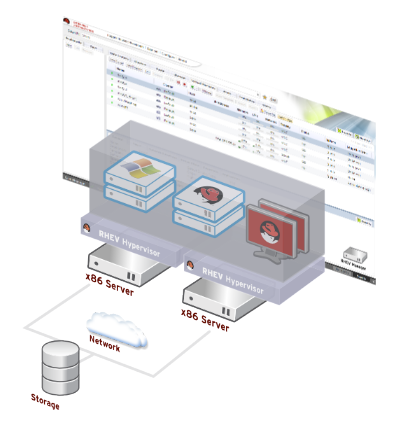 To get access to the RHEV-M 3.0 beta, you must have an active Red Hat Enterprise Virtualization subscription. Go to this RHN page to see links to the beta channels. See this page for discussion around the beta. There is also a Webinar taking place today (18th August). Finally here is the official announcement. I’m getting ready to install RHEV-M 3.0 beta, and that starts with buying some cheap hardware. RHEV-M requires two physical servers, one running our minimal hypervisor RHEV-H and one running the management console. Starting with RHEV-M 3.0 the management console runs on Linux [PDF] (you can still run it on Windows if you want). The management console can be run in a VM, but it can’t unfortunately be run in a VM on top of RHEV-H because there’s a chicken-and-egg problem that the management console needs to talk to RHEV-H to instruct it to start VMs. I’m doing this on the cheap, so the hardware I’ve ordered is not the recommended way. Performance is expected to be fairly abysmal. I ordered two HP Proliant Microservers, and upgrades to the RAM and disks. HP have extended the cashback offer on these servers through August 2011, so I should be able to claim £200 back. The HP Proliant Microserver that I ordered arrived on Tuesday. It’s a nice system and a real bargain even for the full price of £180.